Tae Kwon Do is a Korean martial art which incorporates self-defense moves, hand techniques, and a variety of kicks. At Tamarack TKD our focus is on traditional training. This means we work on gaining discipline through formal practice in a non-contact format. In a formal class, students wear a uniform, bow to show respect, and follow instructors’ directions. Students progress at their own pace. When they are ready, they participate in promotional tests to increase their rank and qualify to learn advanced techniques. Tae Kwon Do is about more than kicking and punching. Students are expected to be good role models in the community. They are encouraged to find ways to show respect to others outside of class. Martial artists are never encouraged to use their skills to take advantage of others. 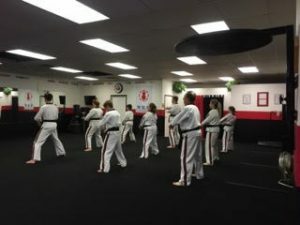 Instructors stress that Tae Kwon Do training is to be used to improve oneself and any techniques outside of class are used only in self-defense. In addition to what is learned physically, students also increase their self-confidence and self-esteem, learn patience, practice goal setting, experience teamwork, obtain leadership skills, acquire a degree of assertiveness, gain self-control, and enhance their concentration and coordination. Martial artists learn discipline and respect while they are exercising, having fun and making new friends. Students have the option of training with other children, other adults, or in combination classes where families practice together. With commitment and a positive attitude, anyone can become a martial artist.